With Google SERP features being increasingly present in the search marketing landscape and constantly shaping users’ search behaviour, measuring their impact on the traditional organic listings becomes vital. AWR has been recently enhanced with new and advanced SERP features tracking capabilities, that enable you to successfully do that. We are now happy to announce awesome new additions to our Free Google SERP Features Tool as well. The Google SERP Features tool is freely available to you on our website, and you don’t even need an account to log into. It’s a great instrument to have when you’re researching and planning your strategy, for educating clients and for keeping track of search marketing changes. So go ahead and check it out, no strings attached. 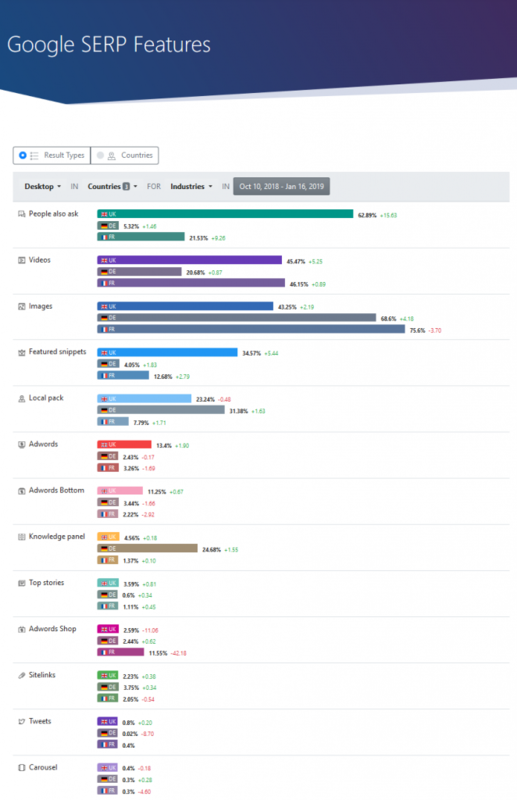 The tool showcases SERP features stats we pull from the millions of keyword we track with AWR, and is updated weekly with fresh data. Result Types – this view focuses around types of SERP features and shows their occurrence in search results for the device, industry, country and date selection you make. Countries – aggregates data around countries and lets you see the global behaviour of SERP features for all tracked countries in one view. If you’re using AWR, you’ll recognize the UI right away, as it contains similar filtering and selection methods. With these filters available, it’s quite easy to manage all the info and pull just the data you need. Now, let’s explore the main areas of the free Google Serp Features tool. Depending on the industry you’re in, you may see consistent differences in the types and volumes of SERP features that show up for your specific search terms, compared with what other industries get. In the “Result Types” tab, you can stack SERP data for your industry up against two other categories, to better understand user search behaviour in your industry and what type of content gets your message across more effectively. Once you figure out how your industry compares to the others, you can go further and broaden the research. 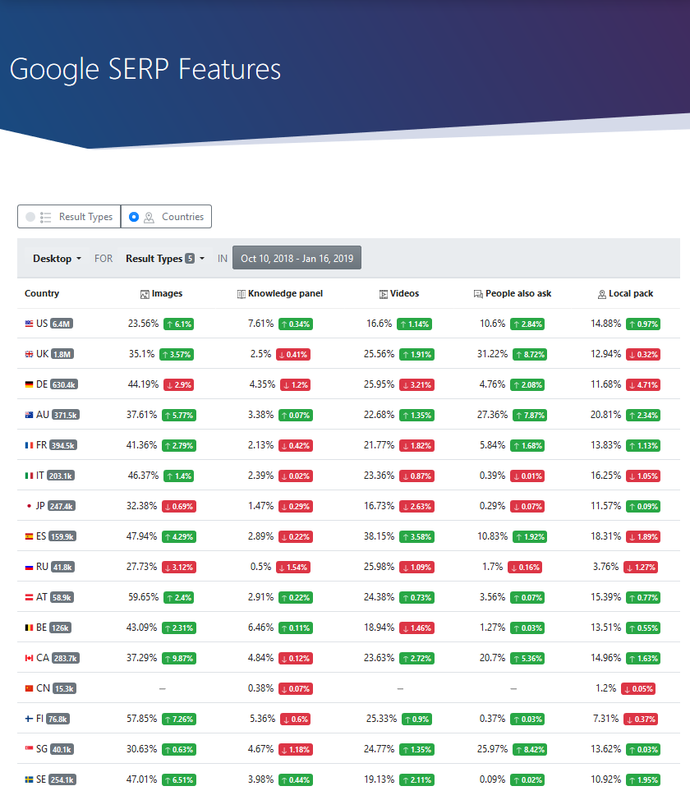 Data shows that the percentages of queries for which SERP features appear are not consistent across countries. So when researching SERPs, it’s more conclusive to benchmark against data from your country or region. The good news though is that with this latest free tool update, the number of countries covered has been extended to 16! 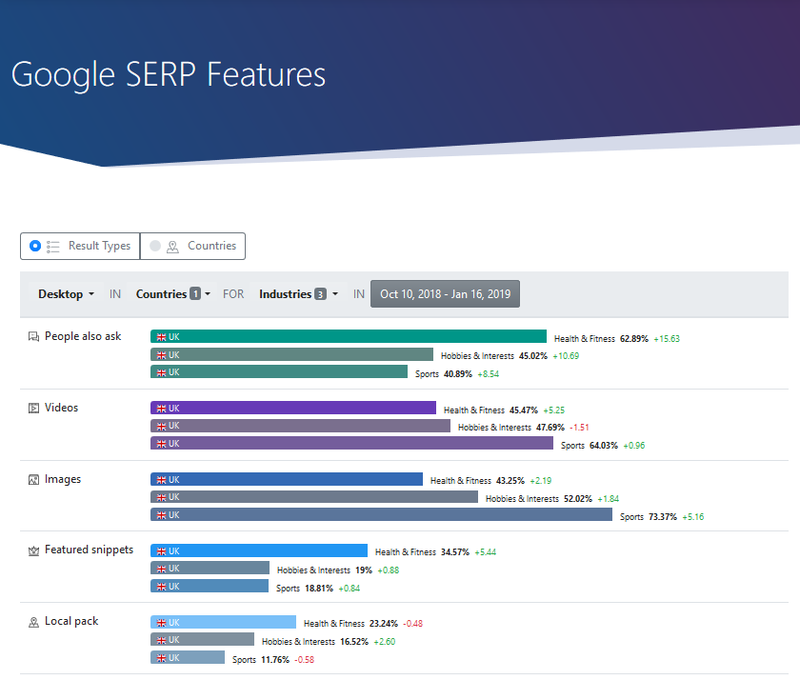 You’ll find the complete list in the “Countries” tab of the tool and a very nice overview on how SERP feats are showing up for each of them. Tip: Make sure you have all the Result Types selected to get a full overview. Switch over to the Result Types tab, to zoom in on the search markets that are relevant to you. You can compare up to three countries at a time, as in the example below, where we chose to compare three European countries, for the Health & Fitness industry. 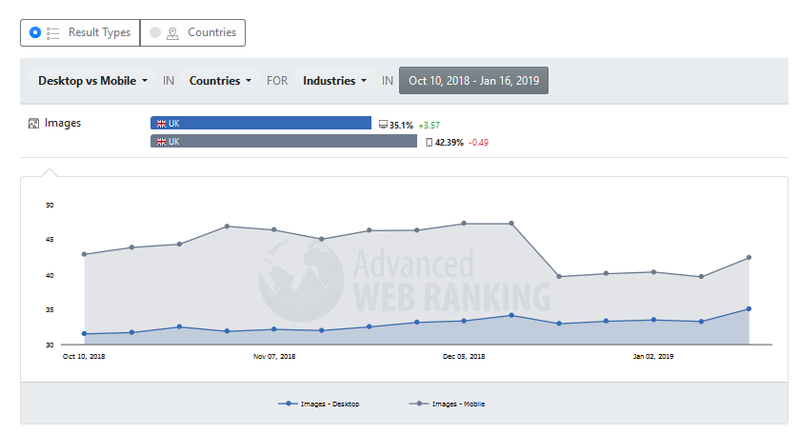 When you click each result type, a chart comparison will expand, with the SERP feature’s progress over time, for the selected date range and countries. With the free Google SERP Features tool you can also track SERP features evolution specifically for the device you are targeting (desktop or mobile), and the country and industry you’re in. More often than not, you’ll find noticeable differences in SERP feature percentages across devices, so make sure to also check the comparison view available. In the “Result Types” tab, select the Country and Industry you wish to research, choose a date range and the “Desktop vs. Mobile” option from the first drop down list, and you’re set. 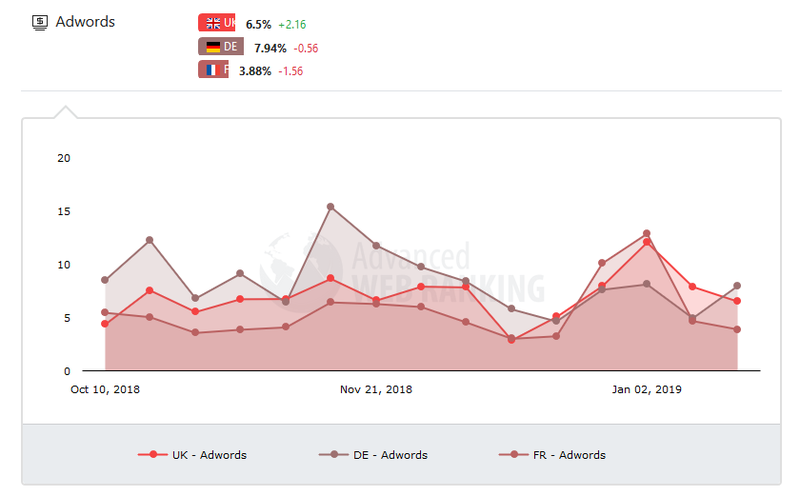 To keep an eye on Adwords listings and get an idea of how often they can be expected to pup up in SERPs for your industry and country, start with the Result Types pannel of the free tool. That’s it for our Google SERP Features free tool overview, hope you enjoyed the tour. Make sure to check it out, and let us know what you think of it. If you enjoyed this free tool, you might also like the other free tools available in the AWR Playground. Thanks Dana for sharing great article. SERP is a paid tool to track the keywords or searching the volume for keywords. Is there any free tool which can be helpful in generating results free of cost ? It is amazing I just take a trial now I plan to upgrade this. Thanks for sharing this. Thanks for this, I want to ask if there is any tools that I can use to track bing serp for free? Thanks for sharing. I only used the Free version, but AWR’s tool is really great. Glad you found it useful, Aniruddh. Fantastic guys. You keep adding to an already great tool. Keep up the good work. Thanks for the information about the useful features of AWR’s tool. AWR did not disappoint me. I’m using AWR to spy my client’s competitors and I’m happy for the results. In fact, AWR can show you a lot more about your competitors. It is really good and I would like to take a trial now . If I found this useful then I will surely go with upgradable plans. Your work is Appreciated! Thanks!